The winter holiday season is traditionally a time for celebration and reconnection with family, friends, loved ones, and the dreaded in-laws. It is also a time for indulgence, with Thanksgiving, Christmas, and the New Year occurring in quick succession. 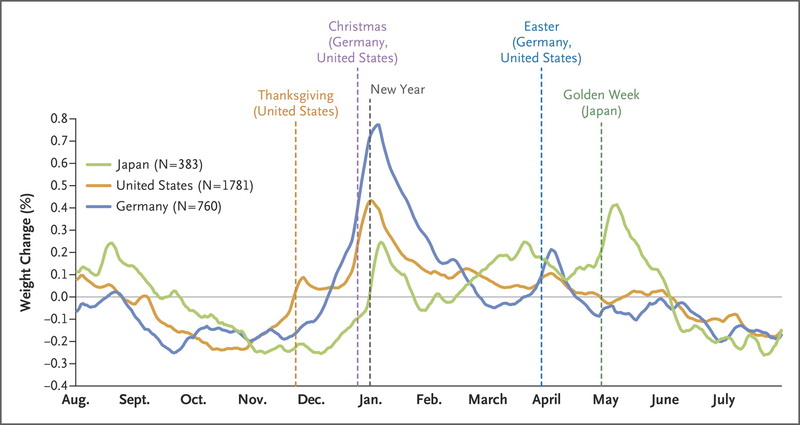 In fact, most weight gain during the year is observed during the holiday seasons. Figure 1: Yearly holiday weight gain in three countries. This isn’t an issue in-and-of-itself, since any added poundage can be lost during other parts of the year. But that doesn’t appear to be the case for most people. Several studies have found that weight gain during the holiday seasons is not lost during the spring and summer months, suggesting that holiday treats may be a key player in the slow, insidious weight gain most adults observe with age. One way to avoid this is to be diligent about your food intake. One study found that people gain an average of 500% more weight per week during the holiday compared to non-holiday weeks, with only the most consistent trackers averaging any weight loss at all. 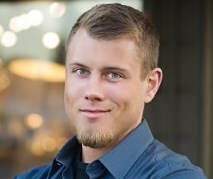 Similar observations have been made with people enrolled in the Diabetes Prevention Program, and successful weight loss maintainers in the National Weight Control Registry report significantly greater attention to weight and eating, greater stimulus control, and greater dietary restraint, both before and during the holidays, than normal weight folk who have never been obese. 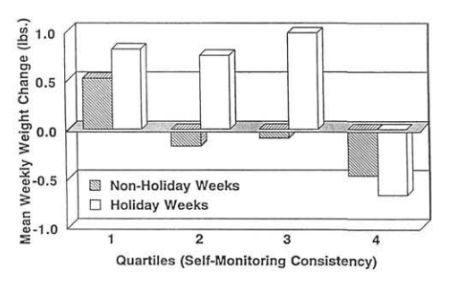 Figure 2: Average weekly weight change based on self-monitory consistency. But let’s be honest - most people do not want to track their food intake, especially during a time when emphasis is placed on hyper-palatable, calorie-dense dishes of deliciousness and peer-pressure from grandma to have that second slice of pie (because you always look too skinny to her). The holidays are a time of enjoyment and indulgence. As such, most people gain significant weight from all the feasting. It is from this feasting that most weight gain happens, and unfortunately most of it sticks around permanently. A better idea might be to simply focus on eating foods that minimize fat gain. I recently published a review article on the role that macronutrients play in determining body composition changes when overeating. Although looking at macronutrients is a rather reductionist approach, it can help us set some guidelines to offset fat gain during the holidays. First and foremost, though, it needs to emphasized that there is a lot we don’t know. Compared to the seemingly endless stream of weight loss studies being published, a mere 25 studies have evaluated body composition changes during times of overeating, with 13 simply reporting on what happens when sedentary people eat 40-60% more calories per day than normal over weeks to months. Spoiler alert: they gain weight, mostly fat. The remaining studies actually compared the effects of different overfeeding conditions. Three studies compared overfeeding on fat to carbohydrate for 2-3 weeks, one study looked at the effects of drinking a pure glucose or pure fructose beverage, and another compared overfeeding on saturated fat (palm oil) to polyunsaturated fat (sunflower oil). Overall, differences between groups for changes in body composition were minor and not statistically significant. The one exception was that overfeeding on saturated fat led to significantly greater fat gain than overfeeding on polyunsaturated fat (81% vs 50% of total weight gain as fat mass). Seven studies compared overfeeding with different amounts of protein. Two of these were in sedentary adults. One reported that eating 2.4 g/kg (grams of protein per kilogram of body weight) resulted in significantly less fat gain than eating either 1.2 or 1.7 g/kg, which had similar effects. However, the other found fat gain between 0.7, 1.8, and 3.0 g/kg to be the same, with the difference instead being that fat-free mass was increased only in the 1.8 and 3.0 g/kg groups. The latter study was a controlled feeding study, which could explain the discrepancy. It is possible that eating more protein leads to greater spontaneous activity that helps offset the excess calories and consequential fat gain. The other five studies were conducted in athletic populations - people who were regularly engaged in resistance training. All but one of these studies had people increase calories exclusively through increasing protein intake, either as whole food or protein shakes (whatever was more convenient for the participant). And all of these studies reported that overeating on protein, with intakes of 2.4 to 4.4 g/kg compared to 1.0 to 2.4 g/kg, either had no effect on fat mass or significantly decreased fat mass, despite increases in fat-free mass. Figure 3: Changes in body weight and composition for the normal protein (NP; 2.3 g/kg) and high-protein (HP; 3.4 g/kg) groups. Each dot represents the change for a single individual. 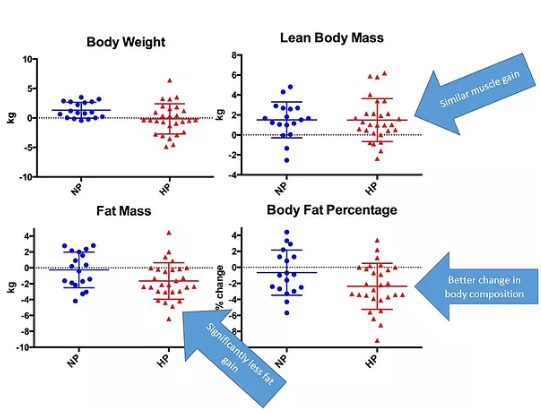 Changes in body weight, fat mass, and body fat percentage are statistically different between groups. Overeating protein appears to be protective against fat gain, especially in people who lift weights. However, overfeeding research is limited and many nuances have not been investigated. So, how can we put these findings into practice during the holidays? Thanksgiving? 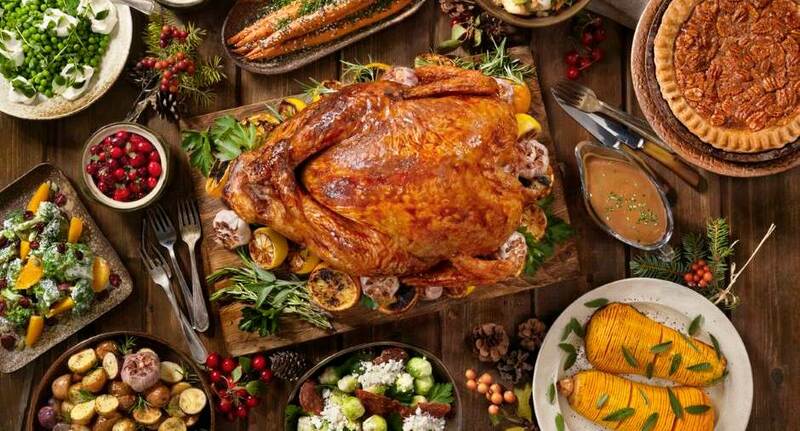 Splurge on turkey. Christmas? Devour the roast. Since you’re going to splurge on food, focus your overeating on protein-rich foods. Not only does this have the greatest likelihood of minimizing fat gain during overeating itself, but protein’s well-known satiating properties might help reduce overeating to begin with.